Swiss Tempelle Deep Purifying Face Wash - Good Buy or Not? 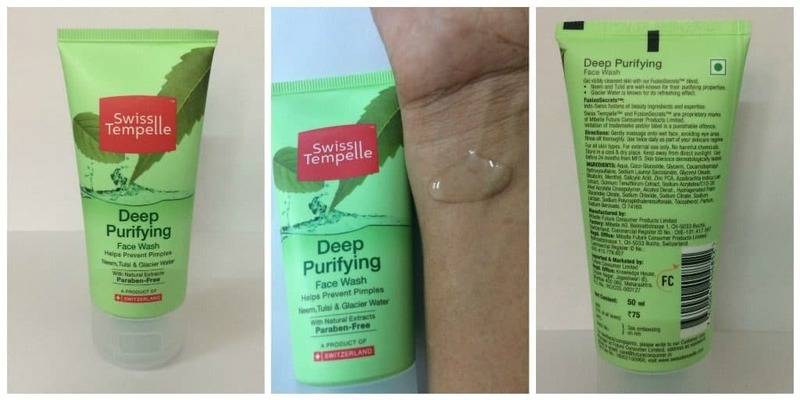 Home ReviewsBeauty Swiss Tempelle Deep Purifying Face Wash – Good Buy or Not? Swiss Tempelle Deep Purifying Face Wash – Good Buy or Not? Who is it for? Swiss Tempelle Deep Purifying Face Wash has been made to suit all skin types. With neem, tulsi and glacier water as its key ingredients, it has been designed to help prevent pimples. Rs 75 for 50 ml. Gently massage on to wet face, avoiding eye area. Rinse off thoroughly. No, this product contains natural extracts and is paraben-free. This face wash comes in a plastic flip top tube. The lid closes tightly so there is no chance of leakage. The 50 ml packaging is quite convenient to carry around for traveling. This face wash has a smooth texture. It does not lather very well but that does not mean that it is not effective. I found it very refreshing and effective as a skin cleanser. A pea-sized amount is enough for the face. It rinses off easily leaving the face dust and oil free. It has a pleasant fragrance which is slightly citrusy. It stays with you for a few minutes after you have washed your face. This face wash works well as it leaves the skin refreshed and dirt-free. It does not overly dry up the skin as is the case with many other face washes. It is quite effective for oily skin as well. I have been using this facewash for over a week now and have noticed that my skin feels oil-free for a longer period of time. Neem and Tulsi have anti-fungal properties that protect our skin from pimples. For me, these two herbs along with glacier water have proven to be very effective as I have not noticed any outbreak of acne since I have started using this facewash. Yes, it is a good buy, especially for the summer season. I will recommend it for people with oily skin as it helps keep the skin oil free for longer, which is a major concern for people during summer months. Oriflame Essential Fairness Multi Benefit Face Cream – Yay or Nay? This one seems the best variant among all the face washes from this brand..